My Mother can get things done that other people can't. She isn't rich or famous with an entourage that bows down to her every whim because they think just being near her makes them cool. She doesn't have a high powered job and a team of yes men she threatens with sacking should they get her a flat white instead of a skinny flat white. She's just a plain ol' secretary and a Nanna with a modest house in the Northern suburbs of Perth full of amazing second hand toys she's found at swapmeets (then disinfected to within an inch of their lives). Yet time and time again, she gets things that others wouldn't. Why? Because she bloody well asks for them! Well that and the fact that she practically knows everyone in the state and is so friendly and helpful that people seem to go out of their way to help her back. So maybe Karma has something to do with it too? A few months back she wrote to the local council saying the park one house down from hers would be a great location for a little playground for all the kids in the two streets that back on to it. If we're honest she wasn't thinking of all the kids... she was just thinking it would be fun to take Tricky there. And whaddya know, they wrote back saying it was a great idea! So, here we have it; Tricky's Park. This woman is seriously cool and is well deserving of the title Super Nan. I've adopted her 'If you don't ask, you don't get' attitude, and it's served me well. As long as you're polite when you ask and don't crack the shits if someone turns around and says no, I think it's a great way to live. Do you ask for stuff? Or do you wait for it to come to you? And more importantly, you wanna come play at the park with us? Chasing a Miracle She asks for parking spots and gets them too! As an ongoing joke whenever we drive in to a packed car park she'll say "We need the parking fairies to give us a spot" and within a few minutes one almost always comes available. It's unbelievable! In fact, I think you might be on to something with the Mary Poppins bit!!! This is great, hooray for Super Nan. We only recently got a local park and it is so exciting! That IS a Super Nan! And yes, I do want to come and play at the park. Even though the kid hurt himself twice last time I took him there, oops. Now you not only have a cool park near you (and yes, I'll drive all the way from the farm to play) but you have the best $2 shop near you too! The benefits of meeting you are just getting better and better! I must not ask right. I always have to work out how to get things done for myself. But you are right, "ask and ye shall receive" as long as you are nice about it (or really, really funny). That is awesome! She sure is a Super Nan, what a fabulous thing to ask for! I'm not very good at asking for things, but on the occasions that I do I'm always surprised at how easy it can be. Yes for sure, we'd love to come play at your park some day. Awesome, way to go Nan!! Funny my husband and I were just talking about this last weekend. Our local park is so run down it's only used as a hang out for dodgy teens and there is not one baby swing in our suburb. Pretty sad I think, so we are thinking of writing to the council for an upgrade. My mum also did this when we were kids, the council sent us the catalogue of equipment, gave us a budget and we got to choose. You can imagine the fun me and my 3 brothers had designing our own playground! I'm like that too! If you don't ask, you don't get!!! Awesome! That is AWESOME! We need more people like your Mum (aka Super Nan) to create great places for kids to play outside, have fun and be creative. I figure people don't know what you want unless you ask for it, the worst that can happen is that they say no. that looks like a fab playground. well done glow nan! tricky looks like he is loving it too, but prob not today with all this terrible rain. I have learnt this over the last year. People aren't mind readers, we all know that, so why do we expect people to know stuff or do things when we haven't spoken up? What a Super Nan! I wish we could come play at the park with you!!! The one time I asked the universe for something I got a yes, so it's definitely worth asking!! I'm not used to asking for stuff, but I'm learning. And I would love to come and play at Tricky's park! I have a similar Mum,she has also organised for a park to be put up just near them. But she got working bees together, had the land cleared and told the younger mums in the area what they should do to get the park up and running. It serves her little as we are so far away, but she liked the idea of the town having a park of their own. I'm a big believer in asking (and slippery slides. That one looks like great fun!). It has certainly paid off for me. And I've found that if you are willing and helpful it means you do, as your super mum has proven, also get things without asking. Grandmother's have the magic touch. Riley will eat anything my mum gives her. ANYTHING. I could offer her the same and she'll just screw up her face 'ewww! yuck!' Thanks, child. Asking is not my natural state, but I find if I push through and do ask, I often get and sometimes even more than what I expected or hoped for. Wow she truly has superhero powers! It also appears that Tricky likes his new park. Perhaps I shall give her "If you don't ask, you won't get" philosophy and see where it takes me. Grandmas are fabulous. She sounds like my mum, and I couldn't do without her. Awesome ! Yay for your Super Nan ! I am definitely one to ask for stuff. Left, front and centre. How cool! I agree with that attitude - you never know if you never ask! I feel really uncomfortable asking, but it has served me well so I'm getting used to it. I am a massive believer in slippery slides too! Parks are wonderful places, especially with a few pieces of equipment to play on! Your Mum sounds Super indeed! OMG that would have been amazing!!!! How awesome is your Mum? Nan's rock! What a great Nat, and a great outlook in life. I love her attitude, and how others love to help her because she helps them....that is a bit like that saying "What you give out, you get back!" 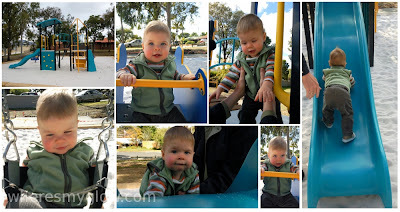 Love he look of he park, and how much fun your son is having!